I've been feeling very unsettled and sad in my home, these days. And now that my cat, Frankie Legs, no longer lives here, it only has gotten worse. My environment is very random, and no matter how much I clean, or move furniture around, I still feel the lack of life here. My special love for art and culture has always transferred beautifully into my decorating, but something here just isn't right. So, I have decided to re-visit my favorite resource: Domino; The Book Of Decorating, and get cracking on the 9-step process of making my pad feel like home. Gather clippings, images, color pallets, objects...anything that inspires you. Create a folder to store all of these items. Be literal and adventurous. I created a desktop folder called "Decorating Inspirations" and add to it while surfing the Internet. In addition to items I have found online, I included family photos, certain articles of clothing and unique vintage accessories to the pile of things that inspire me. Begin to assess, and group these favorite things into themes. Do certain colors keep appearing? Are there shapes that are organic, or more geometric? Is there a lot of art? How about books, movies, popular culture? Some styles that Domino features are: Bohemian, Feminine, Elegant, Vibrant, Masculine, Clean, Tailored, Organic, Classic, Traditional, Modern, Exuberant, Bold, Unconventional, Sentimental, Witty, Comfortable, Punk, Ladylike, Edgy, Cozy, Zen, Romantic, Nior, Dramatic, and Pop. I saw various themes develop when I did this exercise, which didn't surprise me. Rounding up my favorite things was truly the easy part. I saw a consistent color pallet appear, photos and artwork were bountiful, there were lots of organic shapes and textures, plants, patterns from various cultures around the world...and overall, a lot of nostalgia in specific items that I already own. From the list above, Bohemian, Organic, Masculine, Sentimental, and Unconventional all apply to me. This is all about lifestyle, NOT design aspirations. BE HONEST! If you fantasize about having a formal dining room where you can host elaborate dinner parties, but if a) you don't typically entertain much, and b) you end up with a room that can't be used for more practical things like working on art projects. For me, I noticed that when I have guests over, we would typically all gather around my tiny, two-top table in the dining room. This is where my speakers are. I responded to this by setting up a listening area in my living room where the seating is more accommodating for over two people. What do you already own that can be utilized in other rooms, repainted, or donated? What works, what isn't working? This is where the Unconventional theme works well in my design. I enjoy using items that are meant for specific uses, in unconventional ways. Such as my speaker set-up. I converted a vintage record player into a plant stand that also disguises ugly speakers. It looks gorgeous, and I didn't need to purchase anything. Money saved! 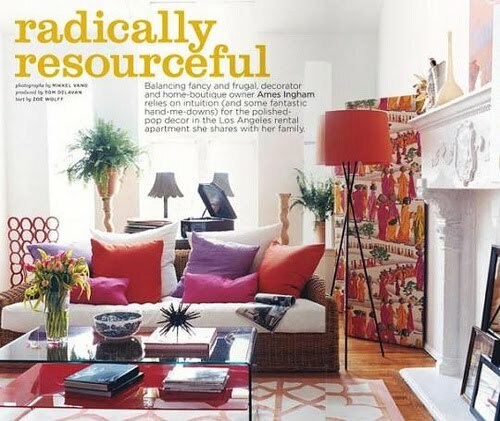 The layout of a room is best when it maximizes how you use the room, and what the focal point is. Does your room have a special feature that you wish to drawn attention to? What kind of flow does it have with hallways and entryways? I literally move furniture once a week. DOMINO HELP ME! Figure out what you have to spend and be realistic about what things cost. Depending on your time-frame, you could do a lot of decorating using cheaper items, or spend a period of time slowly earning more expensive items. You could also splurge on one very special piece and then skimp on others. This area has probably been the largest reason why I have not met a lot off my decorating needs. As goes for anything that costs money. My friend Ritchie and I thrift together occasionally, and we have found some treasures at a very low cost. Although thirfting can tend towards an all-day affair, it's worth it in the end. Number seven goes hand-in-hand with number six. The more time you take to research prices on items, the more bang you're going to get for your buck. Ask your friends where they shop and consult design blogs for ideas as well! And if you are planning on hitting as many thrift shops possible in one day, map it out ahead of time. You're now ready to make decisions. Have fun with your choices and don't be afraid to mix and match your purchases and play with layout. Do whatever works best with your schedule. This way, you will have a timeline for when your room(s) will be completed. I must admit, I have never completed a room. I enjoy the idea of a room changing and evolving over time, and taking different form on whim. It's good to also recognise when a personal style is changing and demands a change in one's environment.